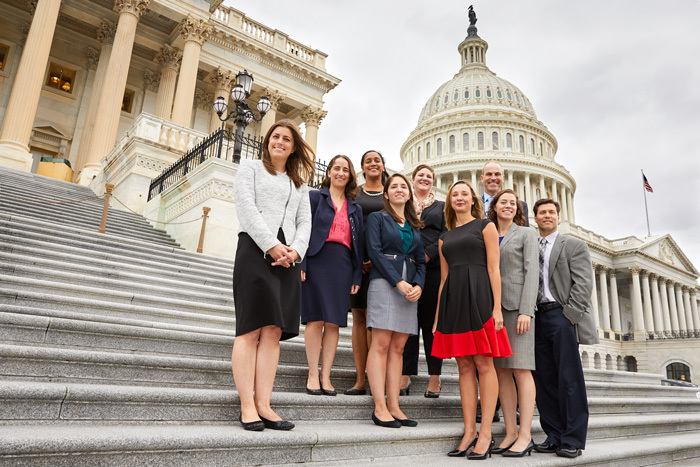 For early career geneticists who would like to transition to a policy career, the Genetics and Public Policy Fellowship provides a 16-month training experience designed to bridge the gap. This unique fellowship includes three rotations: time spent at the National Institutes of Health (NIH) within the executive branch, a staff position on Capitol Hill serving elected officials in the legislative branch, and experience working with the American Society of Human Genetics (ASHG) in the non-profit science advocacy sector. The fellowship is co-sponsored by ASHG and the National Human Genome Research Institute (NHGRI) of NIH. 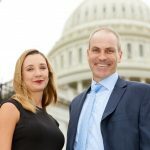 We sat down with Cristina Kapustij, MS, Chief of the Policy and Program Analysis Branch at the NHGRI and Derek Scholes, PhD, Senior Director of Policy and Advocacy at the ASHG to learn more about this fellowship. Both Cristina and Derek are former recipients of the fellowship and now serve as mentors for their organizations. Q: Early career scientists often lack opportunities to engage in policy-related activities. Can you help us understand what you’re looking for in a potential fellow? Derek: We’re looking for early career geneticists with an interest in transitioning from a research career into one that’s focused on health science and policy. We’re particularly impressed with individuals who have in some way tried to get involved in policy, such as those who have sought out policy-related opportunities on their home campus or authored policy-related pieces online. I think it’s important that we work to change the culture within science so the research track is not considered the only legitimate path for an early career scientist. Cristina: Having a scientific background can be versatile and used in different ways. You can take your scientific background into a policy environment, and there are many benefits to having that experience. Q: Most policy fellowships place the fellow in one office, whereas the Genetics and Public Policy Fellowship allows the fellow to participate in three rotations that provide exposure to different career options. Can you describe how the activities differ during each rotation? Cristina: At the Policy and Program Analysis Branch in the Office of the Director, at NHGRI, the fellow might attend Congressional briefings or hearings on the Hill and write up briefs for the leadership within the Institute. They may also spend their time building resources. These resources may be public, such as educational materials on genome editing, or internal, such as a database consisting of historical and current materials on genomics topics that impact the institute. Finally, the fellow is tasked with identifying offices they can work in on the Hill. When the fellow is searching for a Congressional Office and/or Committee and interviewing for a position on the Hill, they look for an Office that aligns with work that they’re passionate about. What’s going on in the current moment influences their work, but if the fellow is particularly interested in a specific area, we’ll make sure to highlight particular briefings or topics they can work on. In this rotation, they have the opportunity to meet with constituents and interested parties. I worked in an office where I had a healthcare portfolio. I would meet with people about all kinds of healthcare issues. I drafted questions for hearings and helped draft statements. It’s always very interesting because you never know exactly what you’re going to get! Derek: Or, you might be involved in a bill that is being considered by a Congressional committee and helping to negotiate the language with its sponsors. At ASHG, we ask the fellow if there’s a topic they’re interested in pursuing during their rotation. If we can accommodate it, and justify it as contributing work to the office, then we seek to do that. There’s a certain amount of essential work that needs to be done regardless of a fellow’s particular interests, but we are very keen to accommodate any special passion they might have. At ASHG, fellows often work on developing policy, crafting statements, and writing memos to leadership to update them on policy developments. There are opportunities to be involved in policy and advocacy events related to meetings they are asked to attend. For example, a fellow might attend a briefing on Capitol Hill and then report back on the event. Our previous fellow worked on a statement about Kuwait’s new law requiring everyone in the country to submit to DNA testing. Q: Mentoring is an important aspect of training. Can you speak more about the network of support available to new fellows? Derek: We have one fellow a year, and we are now in our 16th year. Cristina: Mentors work with fellows to help them transition into and be prepared for the office. We meet with them regularly to ensure the transition is going well. Throughout the arc of the fellowship, we provide resources to help them, such as understanding how life in the policy shop differs from life in the lab and how to find an office on the Hill. We are also working on resources to aid them in finding a job afterward. Derek: We see our role as helping them understand the differences between the culture of a research lab and a policy environment. There’s a strong sense of community within the fellowship. All of the previous fellows know each other, and the vast majority are still working in Washington, DC. We communicate with each other regularly, both professionally and socially, and are willing to help each other out. When a new fellow comes along, everyone helps to orient them to the DC scene. When it comes to picking a Congressional office or providing advice, everyone is open to helping. Cristina: We’re a tight-knit group and we always make sure we’re supportive of each other. The fellowship is a lot of fun! It can be stressful at times, but it’s just because you’re finding your niche. Being in an office on the Hill with your scientific background makes you a unique individual, and that’s really enjoyable! Thomas Clements is a member of the Early Career Scientist Policy Committee and a PhD student at Rice University. His research centers on improving CRISPR-Cas9 gene editing in zebrafish, but he is also passionate about science literacy and inspiring the next generation of scientists to pursue careers that align with their passions. Emily Lescak is co-chair of the Early Career Scientist Policy Committee and a postdoctoral fellow at the University of Alaska Anchorage. Her goal is to increase diversity and inclusion in the sciences while pursuing a career focused on science education and outreach.